Illegal immigration is one of the more contentious social issues facing Americans in the last several decades, dominating political discourse and affecting other social debates including the economy, education, unemployment, equality, and often, healthcare. The illegal immigration debate is fueled by a resurgent nativist movement in the United States that argue illegal immigrants are responsible for a variety of social ills as they take American jobs, fail to pay taxes, and use a disproportionate share of scarce community resources. From a healthcare point of view, the rhetoric against illegal immigrants is fierce and misunderstanding is prevalent as many Americans are worried that illegal immigrants are overburdening the healthcare system at taxpayer expense (Blum, 2012; Bush, 2012; Eviatar, 2009). Rather than appeal to historical arguments that describe the U.S. as a country of immigrants, economic arguments the demonstrate the economic contributions of illegal immigrants, or moral arguments that the U.S. has a moral responsibility to provide care for those who contribute to society, this paper will argue the practical merits of providing healthcare access to illegal immigrants, including improvements in overall public health and the reduction of healthcare costs. Despite arguments that illegal immigrants are a burden to the U.S. public healthcare system, subsidized care for illegal immigrants represent a tiny fraction of overall healthcare spending and in particular, publicly funded healthcare. Mohanty, Wolhandler, Himmelstein, Carrasquillo, and Bor, (2005) found that all immigrant healthcare expenditures in 1998 were 7.9% of total U.S. healthcare expenditures, and government funded healthcare for both legal and illegal immigrants was a mere 2.3% of total expenditures. Another study by Goldman, Smith, and Neeraj (2006) found that because the “foreign-born are relatively healthy and have less access to health insurance, they are disproportionately low users of medical care” (p. 1710); also finding that in 2000, government funded healthcare for undocumented immigrants amounted to $1 billion dollars. Besides lack of health insurance and overall health, there are a variety of additional social and economic reasons that illegal immigrant use of healthcare is far below that of U.S. citizens, including the Personal Responsibility and Welfare Reform Act of 1996, that prevents illegal immigrant access to federally-funded healthcare, the fear of deportation, limited English language proficiency, and social stigma (Derose, Escarce, & Lurie, 2007). In essence, the liminal legality of many immigrants often prevent them from seeking access to healthcare (Menjivar, 2006). While opponents of illegal immigration might consider the limited use of U.S. healthcare resources a positive outcome of tougher immigration policy, existing policies create a number of socioeconomic problems. For example, the lack of access to basic preventative care exacerbates emergency room costs. Mohanty, et al. (2005) found that emergency room costs for uninsured immigrant children were three times as high as those for U.S. born insured children, while annual per capita healthcare expenditures for immigrant children were 86% lower. Medical practitioners suggest that while U.S. hospitals have an obligation to provide care without regards to income or immigration status, that the “early diagnosis and treatment in a primary care setting are both medically preferable and a better use of resources” (Okie, 2007, p. 526). Consequently, in order to reduce healthcare expenditures for illegal immigrants, while improving outcomes, public policy should seek to improve illegal immigration access to primary care by providing low-cost, basic coverage for illegal immigrants and creating national legislation that creates a safe harbor for illegal immigrants in healthcare settings. Another serious policy concern in the illegal immigrant healthcare debate is that of public health. Opponents of illegal immigration argue that illegal immigrants “come most often from countries with endemic health problems [and] the rapidly swelling population of illegal aliens in our country has also set off a resurgence of contagious diseases that had been totally or nearly eradicated by our public health system” (Federation for American Immigration Reform, 2009, p. 1). There is truth in their argument, insofar as “laws and bureaucratic barriers reduce their use of key preventive health services, such as immunizations and screenings for infectious disease” (Okie, 2007, p. 526). However, while FAIR advocates for a public policy of immigration enforcement and deportation as the solution, there are serious flaws in their policy position, including high enforcement costs, labor shortages, and damage to the economy (Immigration Policy Center, 2012). Rather, policy should encourage immunizations and infectious disease screenings for every uninsured person, immigrant or otherwise, within U.S. borders as a matter of public health. Indeed, the U.S. Congress has provided significant funding to the Centers for Disease Control global fight against contagious disease, recognizing that “infectious disease knows no boundaries” (Centers for Disease Control and Prevention, 2011, p. 1). In addition, since 2002, the United States has spent over $19 billion in the global fight against AIDS, TB, and Malaria (USAID, 2010). It stands to reason that nativist sentiment and anti-immigrant rhetoric should not prevent the U.S. from implementing rational public health policy to prevent the spread of contagious disease within its borders. The rise of nativist sentiment, fueled by anti-immigration groups like FAIR and others, has led to an irrational policy debate over public healthcare that is replete with misinformation and emotional appeals suggesting illegal immigrants are the cause of a disproportionate share of the problems in the U.S. healthcare system. There is no room in the healthcare debate for scapegoating, given the U.S. has the highest healthcare spend in the world and the lowest quality of care in the developed world (Altarum Institute, 2012; Davis, Schoen, & Stremikis, 2010). While illegal immigrants use disproportionally less healthcare than U.S. citizens, there remain problems with public policy that increase healthcare costs for illegal immigrants beyond what they should be, and increase public health risk. Illegal immigrants live and work in the United States; it is simple fact. Rather than continue to decry their presence or support unrealistic policy positions, the U.S. should work to implement pragmatic policy solutions that reduce healthcare costs and improve the public health by improving illegal immigrant’s access to primary care, immunizations, and infectious disease screening in a safe, and stigma-free environment. Altarum Institute. (2012). Health Sector Economic Indicators: Spending Brief (pp. 1-2). Ann Arbor, MI: Center for Sustainable Health Spending. Davis, K., Schoen, C., & Stremikis, K. (2010). Mirror, mirror on the wall: How the performance of the U.S. health system compares internationally (pp. 1-22). Washington DC: The Commonwealth Fund. Goldman, D. P., Smtih, J. P., & Sood, N. (2006). Immigrants and the cost of medical care. Health Affairs, 26(6), 1700-1711. Okie, S. (2007). 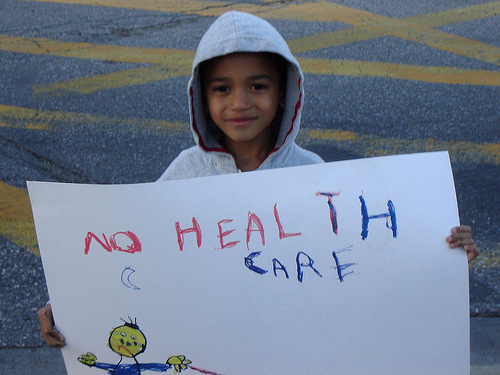 Immigrants and health care: At the intersection of two broken systems. The New England Journal of Medicine, 357, 525-529. Rethinking Healthcare in the U.S. The United States healthcare system can be considered both highly successful or failing, depending upon the lens it is examined with. For instance, 10% of the 2011’s top 50 most profitable companies in America are part of the healthcare system; they are in order of profitability, Pfizer, Eli Lilly, United Healthcare, Abbot Laboratories, and CVS Caremark (CNNMoney, 2011). When thinking about the healthcare system in terms of profitability, it is filled with members of a highly paid profession (Brym & Lie, 2007), it is a highly profitable business for many companies (CNNMoney, 2011), and companies involved in the system have figured out how to get U.S. residents and the U.S. government to spend more than 18% of the entire U.S. GDP on healthcare (Altarum Institute, 2012). So if we consider the success of our healthcare system based on profitability, the U.S. has the most successful healthcare system on the planet. 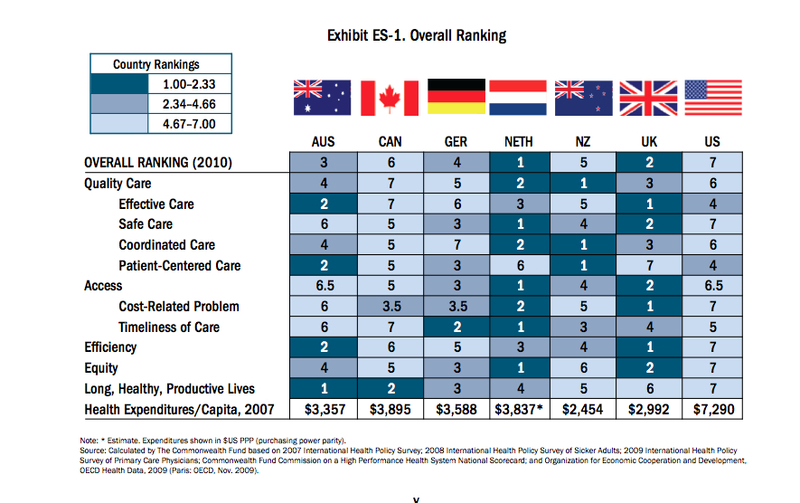 Figure 1 – The Commonwealth Fund’s Overall Ranking of Healthcare Systems. Some might argue that the U.S. healthcare system was never intended to provide equal access or solve equity problems, perhaps a fair argument. According to Davis, et al. (2010), “even when access and equity measures are not considered, the U.S. ranks behind most of the other countries on most measures” (p. vi). The question we should be asking our healthcare providers, citizens, and government, is “do we deserve better value for our investment?” Given that we spend more per capita, more as a percentage of GDP, and more in absolute dollars than any other country on earth, shouldn’t U.S. residents live the longest, healthiest, and most productive lives? Should the U.S. have the lowest infant mortality rate? Shouldn’t U.S. residents receive the highest quality care? Another implication of the scorecard, when including equity and access rankings is that other countries are providing higher quality care to more of their population for less money. Australia, Canada, Germany, the Netherlands, New Zealand, and the United Kingdom all run more efficient and effective healthcare systems, and most of them provide universal coverage (Davis, et al., 2010). Therefore, should it be possible, given the U.S. healthcare spend, to provide access to quality healthcare for all residents? Of course it’s possible. However, many things about our current national healthcare system would have to change, including the profitably, perhaps even the viability of some of the most profitable companies in the United States, and there is the real rub. In 2011, the healthcare industry spent nearly $500 million dollars lobbying the U.S. government, more than any other industry; and since 1998 the industry has spent more than $4.5 billion dollars; yes, billions (Center for Responsive Politics, 2011). I wonder whose war chests the money went towards? It is no mystery where political parties landed on the Obamacare debate, with Democrats largely for the measure and Republicans largely against; an outcome that wouldn’t surprise Brym and Lie, given the variation in class support between Democrats and Republicans. Brym and Lie (2007) suggest that “organization is a source of power” (p. 371) that accounts for the success of political parties or legislation. $4.5 billion dollars buys a lot of organization. The good news is that the passage of Obamacare may provide opportunities to increase access to the nation’s healthcare system for many. In addition, as more low-income patients receive care, inequality in the system may be reduced. 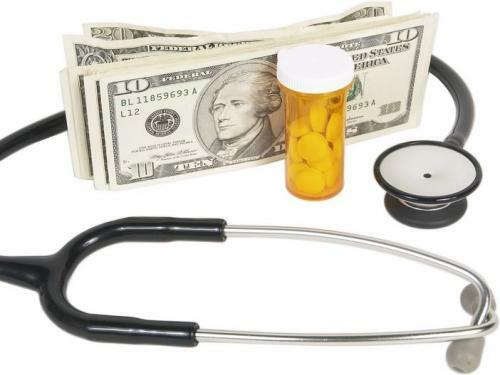 However, it is unlikely that any existing measures to improve the nation’s healthcare system will address reduced spending or better healthcare outcomes, as fundamentals of the system remain overly capitalistic. As a result, the success of the nation’s system will likely remain measured based on the balance sheets of our nations healthcare companies, rather than the lives of our citizens.